The Buenos Aires City Legislature is a central part of the Government of the City of Buenos Aires, Argentina. It is housed in the Palacio de la Legislatura de la Ciudad de Buenos Aires, an architectural landmark in the city's Montserrat section. The body is led by the Mayor's lieutenant, the Vice-Chief of Government (Vicejefe de Gobierno), who acts as President of the Legislature. He (or she) is assisted by three Vice-Presidents and Parliamentary, Administrative and Coordinating Secretaries. Gabriela Michetti of the center-right Republican Proposal party became the first disabled individual to occupy the post of President of the Legislature in 2007; she left this post ahead of the June 2009 legislative elections, where she won a seat in the Argentine Chamber of Deputies. The post is currently occupied by Vice-Mayor María Eugenia Vidal. The body is composed of 23 committees, and the 60 legislators belong to 16 parties (a number of which form part of coalitions). No one party currently holds an absolute majority, though Mayor Mauricio Macri's Republican Proposal (PRO) is currently the largest, with 26 seats. The Front for Victory (the center-left party led by the President of Argentina, Cristina Fernández de Kirchner) has struggled in Buenos Aires and holds 8 seats in the city legislature. The leftist Proyecto Sur holds 6; the Broad Progressive Front, 4; and 8 other parties (mostly on the left) share the remaining 16 seats. 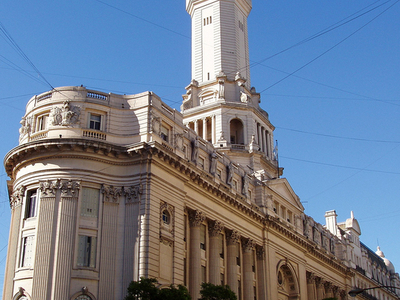 Here's the our members favorite photos of "Government Buildings in Buenos Aires". Upload your photo of Buenos Aires City Legislature!